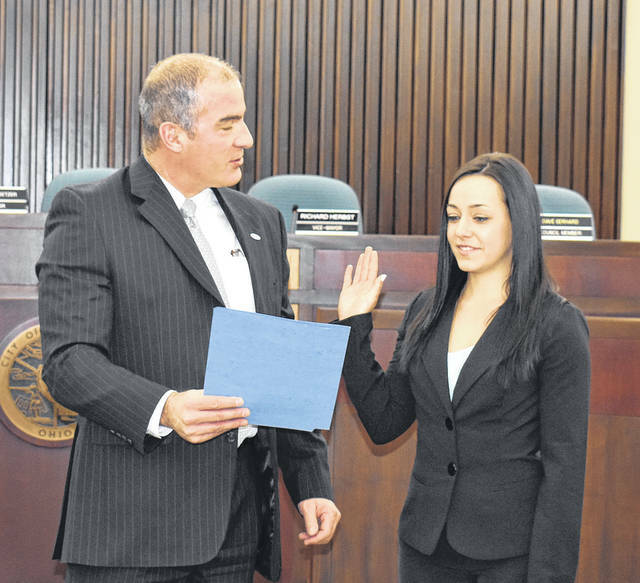 Vandalia’s newest police officer Julie Hinders was given the oath of office Tuesday morning by City Manager Jon Crusey. Vandalia Police Sergeant Doug Nagel receives the oath of office from City Manager Jon Crusey upon his promotion on Tuesday morning. Nagel was also awarded the department’s Distinguished Service Medal for the second time. 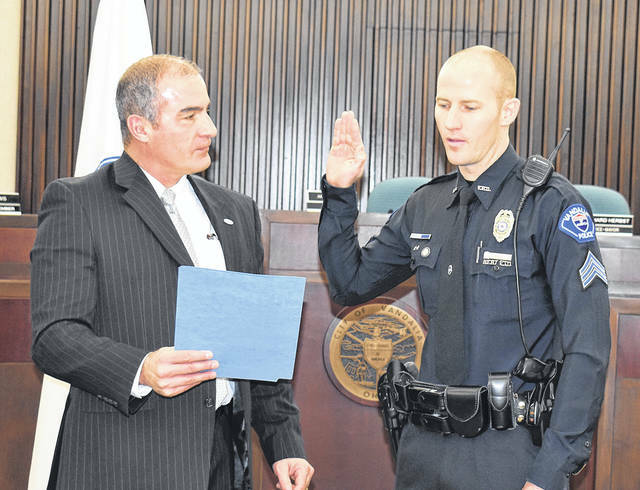 VANDALIA — The Vandalia Division of Police promoted an officer to sergeant and also swore in a new police officer during ceremonies on Tuesday morning. Doug Nagel, an 11-year veteran of the department, was promoted to sergeant while Julie Hinders, currently a police officer at Sinclair Community College, was sworn in as the department’s newest officer. Nagel was also awarded the department’s Distinguished Service Medal for the second time. He became the first Vandalia officer to receive the award twice. Nagel’s award came as the result of his actions on October 24, 2018. While off duty, he came upon a serious head-on auto accident at W. National Road and Frederick Pike in Butler Township. Two males were trapped in one of the vehicles which had caught fire. Nagel successfully extricated both men from the vehicle. “Officer Nagel’s quick assessment and actions undoubtedly saved the lives of both men,” wrote Vandalia Fire Chief in nominating Nagel for the award. During Nagel’s career he has served as a patrol officer, crime prevention officer, a field training officer, acting watch supervisor, vehicle maintenance officer, and as a member of the Regional Emergency Response Team. He has a Bachelor’s of Science in police administration from Eastern Kentucky University and is currently working on a master’s degree through Central Michigan University. Officer Hinders is a Vandalia native and graduate of Vandalia-Butler High School. She received her peace officer certification from Sinclair Community College in 2016 and has served that campus and Grandview Medical Center. She will begin field training soon. “It’s not only exciting to be adding a new officer, but Julie is someone who grew up in Vandalia, she attended Vandalia-Butler High School, she’s familiar with the area, and she has a passion to serve the citizens and the community where she grew up, so we are very happy to have her join the department,” said Althouse. Reach Darrell Wacker at (937) 684-8983 or on Twitter @VandaliaButler.